SINGAPORE — When the lease of his three-room flat in Lorong 4 Toa Payoh runs out in 2066, first aid and swimming coach Low Mong Seng, 34, expects the Government to give him “something in compensation”. “Either another shelter over our heads, or a lower lump sum amount (compared to the value of the property) for us to get another flat to stay in,” said Mr Low, who inherited the unit from his mother who died in 1995. But another homeowner, who gave her name only as Ms Kwok, has a different view. There is “a misunderstanding (among the public) of what homeownership is”, she said. “People think ‘ownership’ means a freehold ownership but if you buy a leasehold then obviously the limited lease is reflected,” added the 30-year-old lawyer. Three years ago, she bought a three-room flat in Tiong Bahru — completed in 1973 — with her husband. The issue of the lease expiry of older Housing and Development Board (HDB) flats has seized many homeowners in Singapore, since a blog post in March last year by National Development Minister Lawrence Wong. Mr Wong had cautioned that not all old flats will be automatically eligible for the Selective En bloc Redevelopment Scheme (Sers) — amid media reports of buyers paying huge sums of money for ageing resale flats, in the hope that the flats would be identified for Sers. As at Dec 31 last year, HDB manages a total of about one million flats. The vast majority of the flats have more than 60 years of lease remaining, HDB said in response to TODAY’s queries. About 9 per cent of the flats (or 90,000) have leases that commenced more than 40 years ago, it added. The first batch of HDB flats with leases that will expire in about 50 years are located in Geylang and Queenstown. "As the leases run down, especially towards the tail-end, the flat prices will come down correspondingly," Mr Wong had said. "So buyers need to do their due diligence and be realistic when buying flats with short leases. This is especially important for young couples, who have to plan for a much longer future." The issue has received substantial airing in Parliament since, with Members of Parliament (MPs) raising concerns and suggestions. Last month, Mr Wong said the Government is studying the issue, as he highlighted the complexities involved. "It will be easy for me to give you a politically expedient answer now and try to wave away the problem. But there are serious trade-offs and ramifications to consider," he said. He added: "Ultimately, the government must grapple with these difficult questions, study the matter, and do the responsible thing." Meanwhile, some owners of ageing flats have been spooked, amid a tepid HDB resale market which has seen prices fall for six consecutive quarters. Speaking to TODAY, a homeowner at Block 117 Lorong 1 Toa Payoh, who declined to be named, put up his 50-year-old three-room flat for sale about six months ago, out of concern that its value will fall following Mr Wong’s comments. There have been no takers yet, even though several prospective buyers have viewed the unit — and even though he has priced it under S$290,000, while other comparable flats in the area sold for as high as S$340,000, said the man in his mid-70s who is the flat’s second owner, having bought it more than 30 years ago at S$10,000. Similarly, Mr Calvin Loh, 38, a hardware goods showroom manager, said he is also getting anxious about the value of his Commonwealth Close flat, which has 47 years of lease left. He noted how a former neighbour sold his three-room unit for S$400,000 four years ago, but a similar unit in the same block changed hands for just S$280,000 a few months ago. To these long-time homeowners, it does not matter that in absolute terms, the price which they can get for their ageing flat will be many times higher than what they bought it for. What weighs on their mind is the worry that they are not getting a high enough price, relative to what they could have gotten when the flat was younger or the cost of an alternative home on the market today. High profile million dollar sales of old resale flats in good locations, which have been highlighted by some sections of the media, further skews the market and raises the expectation of sellers. This is, however, an unrealistic expectation, experts stressed. Among other factors, flats with less than 60 years’ lease may start to depreciate as prospective buyers would have limited use of their Central Provident Funds to help finance the purchase of the flat. As the flats get even older, financing options from HDB or banks become more limited. “When that happens, flat owners may have to accept that their older flats may not be able to command as high a price anymore, and may be more difficult to sell in the open market,” Mr Lim said. Mr Ku Swee Yong, chief executive officer of International Property Advisor, noted that the situation has been made worse by buyers overpaying for ageing resale flats in recent years, and price decline going forward is “inevitable”. “(The) prices of well-located old flats have reached high levels not commensurate with their future cash flow value (from a rental perspective),” he said. While lease expiry is a challenging issue faced by policymakers in all countries with public housing programmes including China and the United Kingdom for example, it is a political hot potato especially in Singapore, where more than 80 per cent of the resident population live in HDB flats. Moreover, homeownership is “far more popular than renting in Singapore and, arguably, an intrinsic part of the social compact”, said Singapore Management University (SMU) law don Eugene Tan. “Relying on a contractual understanding of the leases is legally appropriate (for the Government) but politically limiting and divisive,” he noted. At the heart of the debate is a very Singaporean view of public housing flats as “sure-win” investments — a mindset that the Government is partly responsible for shaping, experts pointed out. Still, the experts were divided on whether the narrative of HDB flats as assets remains valid today and in future: It is true that unless buyers overpaid for a resale flat, chances are high that they can still sell it off for a profit. For most homeowners, the value of their flat has, without a doubt, increased exponentially compared to the price which they had paid for it years back. However, it is also clear that the value of a flat cannot be perpetually rising and there will come a point in time — at least a decade from now even for the oldest flats — when it drops dramatically, as its remaining lease falls under 30 years. The People’s Action Party (PAP) Government has long held up homeownership as a way to give citizens a direct stake in the country. Over time, its “asset enhancement policy” became a buzz phrase for public housing. Since the 1990s, it has drummed in the idea of an HDB flat as both a home and an asset, providing Singaporeans an important form of retirement security. Former Prime Ministers — Mr Lee Kuan Yew and Mr Goh Chok Tong — made bold pitches for asset enhancement, while in the last decade or so, government leaders continued to refer to a HDB flat as a “key investment asset”. In 2011, then-National Development Minister Mah Bow Tan also reiterated the importance of the policy as he rebutted a suggestion by the Workers’ Party to peg the prices of new flats to the incomes of qualifying households instead of resale market prices. Mr Khaw’s comments came after the first million-dollar flat changed hands in July 2012, at Block 149 Mei Ling Street in Queenstown. But it appears that Mr Khaw’s warning was not enough to deter buyers from dishing out big bucks for HDB resale flats. Since the first million-dollar HDB flat transaction in Queenstown, at least 89 flats have been sold S$1 million or more, according to public data. The trend called for a starker warning, and Mr Wong duly delivered it in his blog post in March last year. A month later, he responded to the strong public reactions to his blog post, as some questioned how the asset-enhancement policy for public housing would apply when HDB flats have to be returned to the Government upon expiry of their lease. Mr Wong reiterated that HDB flats provide a “good store of asset value, so long as you plan ahead and make prudent housing decisions”. He cited a hypothetical example of a 30-year-old couple, with a combined monthly income of S$5,000, looking for a resale flat in Woodlands near their parents. “They can get up to S$75,000 in grants off the resale flat price, and should easily afford a flat with a reasonably long lease of 90 years,” he said. The experts noted that the Singapore public has lapped up the “asset enhancement” message so much that it is inconceivable for many homeowners today that the value of their flats would head south towards the tail-end of the lease. “One entire generation has already made their profits. Those who are left holding their flats today are disappointed that they did not downsize or sell out to extract their profits (earlier)” Mr Ku said. But Mr Alan Cheong, senior director of research and consultancy at Savills, warned that there could be profound consequences — such as worsening social inequality — if HDB flats were to be treated as “depreciating assets”. Speaking in Parliament last month, Mr Wong acknowledged concerns about the impact of lease expiry on resale prices. But he stressed that there is still value in older HDB flats, which can be unlocked for retirement. Citing transaction data over the past year, he noted that an older four-room flat with less than 60 years remaining would sell for around S$300,000 and a five-room flat would sell for around S$400,000 in non-mature estates. For flats in more popular locations, prices can be significantly higher – more than double the price, Mr Wong said. Apart from the length of remaining lease, transacted prices depend on other attributes such as location, the storey height, and the condition of the flat, he added. The sales proceeds from older flats "would be more than sufficient to purchase a smaller flat for retirement", he said. Those who prefer to stay in the same place can also use the Lease Buyback Scheme, where they can sell part of the remaining lease to HDB or have the option of renting out a bedroom. Mr Wong reiterated that existing monetisation schemes are working. Nevertheless, the Government will continue to review and enhance them, he said. However, in a commentary published by TODAY, NUS Institute of Real Estate Studies director Sing Tien Foo wrote that there is a “significant negative relationship between HDB resale prices and age”. His analysis was based on a large sample of public resale flat transactions from 1997 to 2017, and after controlling for the quality of transacted resale flats — such as the flat attributes (unit area and floor height), and distance to schools and MRT stations. Using resale flats of less than 10 years as the reference, the discounts are estimated at 8.3 per cent and 9.5 per cent for resale flats of 40 to 50 years and those between 50 and 60 years old, respectively, Assoc Prof Sing said. Without a doubt, a homeowner who bought his flat in the late ‘60s for example can easily sell it today at a price more than 40 times compared to what he had paid, analysts noted. Even for those who bought their flats some years back, it is likely that they can sell it for a profit. It may be a different story, however, for ageing flats which were bought recently — and this is how it should be, the analysts said. An effective property market should reflect the flats’ decaying lease and these units should be sold accordingly, in terms of pricing. As to the residual value for such flats, the analysts reiterated that even this will plunge dramatically when the units have less than 30 years of lease left. Applying a common industry forecasting template that correlates the value of land with respect to its remaining lease, Mr Ku predicts that a flat which was completed in 1975 — and priced at S$860,000 today — would fetch only S$180,000 in 2054, when it has 20 years of lease left. When the time comes, “how many buyers will put down such a large sum of money to use a property for 20 years”, he questioned. [This is based on a 5 room flat. The rental per month for a 5 room flat today is say, $2000, depending on the location, the floor it is on, etc. That means an annual rental of $24,000. And $240,000 for 10 years. And $480,000 for 20 years. Work in the Present Value/Future value of paying for a 20 year rent in advance, $180,000 seems like a $300,000 discount. Less, once you discount the upfront payment. Public data on HDB resale transactions in the last three years showed that older flats — those with half of their 99-year lease remaining or less — were fetching lower amounts, and underperforming compared to the rest of the HDB resale market. While the experts noted that the sample size is too small to draw any conclusion, they observed that there is some anxiety creeping into the HDB resale segment. Mr Colin Tan, director of research and consultancy at Suntec Real Estate Consultants, said the priority for now should be to “quell any panic”. OrangeTee & Tie managing director Steven Tan, for one, believes that the market for older HDB flats will be stirred back to life in the short to medium term, notwithstanding the longer term price trajectory. “As the overall market sentiment improves, led by the recovery in the private residential market, HDB resale prices is expected to bottom out in the foreseeable future,” he said. HDB noted that flats with a shorter lease may appeal to certain groups: For example, elderly homeowners looking to right-size their home, families who are not yet ready to commit to a longer lease, and buyers looking for a home in more central locations with established amenities. “There continues to be healthy demand for such flats in the market, and there is value in these flats that can be unlocked for retirement,” HDB reiterated. In terms of prices, HDB noted that its resale price index has fallen by 2.3 per cent in the first quarter of this year, compared to the same period in 2016, “following the earlier property cooling measures”. “As the (index) shows the general market price trend, it follows that the transaction prices of all flats, regardless of age, would generally experience a slight dip within this period,” HDB said. Noting that the attractiveness of an HDB flat is “dependent on many factors, not just the length of the lease”, HDB stressed that it would be “inaccurate” to look at price changes alone to determine whether prices for older flats have fallen more, “as such a comparison does not take into account differences in other flat attributes, especially location”. For many owners of old flats, Sers is the best-case scenario. Residents of blocks of flats identified for Sers will get the opportunity to move to a new home with a fresh 99-year lease, and continue living close to their current neighbours. They will also be given compensation and rehousing benefits. Among the suggestions brought up during last month’s debate on the President’s Address, Marsiling-Yew Tee GRC MP Alex Yam proposed that the Government consider applying Sers to all HDB flats when their lease runs under 40 years. Mr Yam said this will allow the use of parcels of land to be intensified with topped-up leases, while easing the country’s reliance on “constant piecemeal upgrading” in old estates, which he felt was “not the most cost-efficient”. But such a proposal will put a huge financial strain on the Government, the experts said. Mr Ku estimates that it will cost the Government S$3.5 billion annually from 2030. [I was also under the assumption that SERS would be costly to the govt and with the tight budget these days, it would not be feasible. Then I found this (link to MOF - see answer to Q7) . This means that while it IS still costly - there is still the costs of compensation for the flat (less the land component), and rehousing benefits - it is not as costly as I thought. For ease of computation, let's assume that on average the compensation per flat is $300,000. How much of this is the Land Component that could be financed by past reserves? 10%? 50%? 90%? I am quite sure it is not 90% because the rehousing component or "reasonable expenses" is already over $10k. So the flat (without the land component) would be valued at less than $20k? It could be 10%. 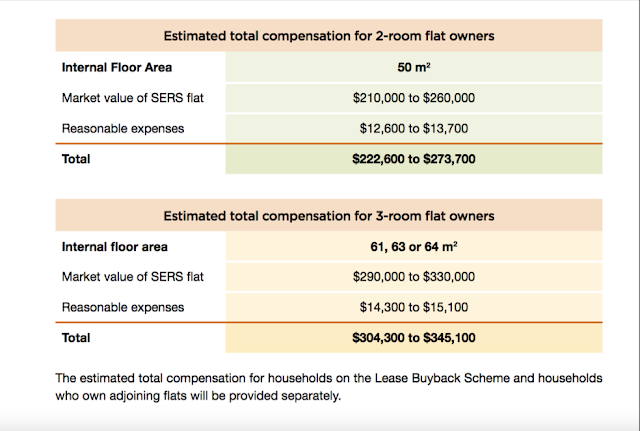 Which means that for the 313 flats being SERS-ed, the land component would be approximately, $9.4m. Out of a total compensation of about $94m. Not implausible. I do not know how the land component is valued. Or perhaps the land component is compensated to HDB? I do not know. If so, the full compensation to the flat owners do not include the land component at all, so the costs to the govt is the full compensation. of about $100m. Which is not a lot to the Govt. But this seems like a small SERS project of just 313 units, and only comprising 2 and 3 room flats. In other SERS projects, there were 4 and 5 room flats and those would have had heftier compensation. Similarly, Assoc Prof Sing felt there is no urgent need to increase the pace of Sers, which could “significantly increase” the Government’s expenditure. “The current approach of Sers is an appropriate one, while allowing some older housing stocks to be replaced, redeveloped and intensified into newer housing blocks,” he added. In his parliamentary speech last month, Mr Wong also pointed out that the authorities cannot assume that everyone wants a lease extension. More maintenance will be needed for older flats, and this will be costly for residents, he said. Also, if all 99-year leases were to be automatically renewed for extended periods, there will not be sufficient land to provide affordable housing for future generations of Singaporeans, HDB said. Apart from adding to Government expenditure, Mr Cheong said that extending the leases of older flats will also impede urban renewal, with the older estates affecting the aesthetics of nearby newer ones. However, Mr Tan Kok Keong, co-founder of FundPlaces which develops blockchain platforms for the real estate industry, felt it would be a palatable option for many owners of ageing flats. “A lease top-up at minimal cost. Why wouldn’t I not want it? Even if I don’t want (to continue living in the flat), I can sell and get better money,” he said. There has also been a suggestion for private developers to come into the picture. Fengshan MP Cheryl Chan has proposed a “modified form of Sers”, which would involve private developers compensating flat owners and buying over the land from the Government, so they can top up its lease for private development. She has also suggested changing the valuation method for ageing flats so that it is based on their remaining lease and right-sizing potential, extending the lease for flats in selected mature towns, and reassessing the property loan structure for prospective buyers. Speaking to TODAY, she felt that her “modified Sers” proposal could also result in better social mixing, with private estates better interspersed among HDB blocks. Both Mr Tan, from FundPlaces, and SMU’s Assoc Prof Tan said it was a sound idea, as it could be a win-win situation for all parties — residents, developers and the Government — and also enable the lower-income group benefit from the en bloc fever sweeping through private residential developments. Mr Tan agreed that the construction of condominiums in older HDB estates would encourage greater social mixing. However, if this was done a large scale, it could risk HDB neighbourhoods losing their character, he noted. Mr Ku felt that the idea was not feasible administratively, given that a parcel of land typically has to be cleared first, then demarcated before being sold to private developers. “You cannot put a piece of land up for tender if you cannot define the site boundaries,” he added. Ms Chan acknowledged that the issue was complex, and said that her idea cannot be adopted in isolation. “You can’t just use one single lever and expect it to work because this is a free market after all, which is why I am suggesting certain things that the Ministry (of National Development) should start looking into so that we can start testing with a pool of flats and gradually make changes as we move along,” she said. Indeed, the experts believe there is no single solution to the conundrum. It may entail a mix of different policy options, on a case-by-case basis. But of more pressing need is for buyers and sellers to adjust their mindset, to befit reality. “This issue of ‘decaying leases’ is likely to be a circle that cannot be squared,” said SMU’s Assoc Prof Tan. However, some like Mr Ku from International Property Advisor felt that the mindset could be already shifting among the younger generation who are “less smitten with homeownership” — as in the case of Mrs Kwok. She and her husband bought their three-room Tiong Bahru flat, which had 57 years left on its lease, for about S$650,000. She said they did it “with two eyes open”, knowing that it will depreciate down to zero when its lease expires. “I suppose it is good that (people are discussing about this now)… (But) it is a strange conversation… The leasehold is what it is. You have a lease,” she said. SINGAPORE — Three blocks of flats at Blocks 81 to 83 MacPherson Lane are the latest to be selected for the Selective En bloc Redevelopment Scheme (Sers), the Housing and Development Board (HDB) announced on Thursday (May 31). A total of 313 residential units, most of which are two-room and three-room flats, will be affected, along with 27 shops and two eating houses. Residents of the 50-year-old flats will be offered replacement units in three brand-new 17-storey or 19-storey blocks of flats being built on Circuit Road, which will have an estimated 630 units. Their new flats, which are expected to be completed in the second quarter of 2023, will be located near the MacPherson MRT station and the Pan-Island Expressway. The HDB said the new flats will have recreational and communal facilities, as well as a commercial block with a supermarket, shops and two eating houses. Elder and childcare centres will also be available. Affected residents will have to move out of their current flats between the fourth quarter of 2023 and first quarter of 2024. Owners of the commercial properties, on the other hand, will be given compensation based on the market value of their units at the time of the Sers announcement, said the HDB. They may opt to buy a new unit on a 30-year lease or choose to rent a new unit. Those who choose not to take up a new commercial unit will receive an additional payment pegged at 10 per cent of the market value of their existing unit, added the HDB. All affected owners will be invited to a Sers exhibition held from June 2 to 4 at the hard court beside Block 81 MacPherson Lane. Completed in 1968, the three blocks on MacPherson Lane will be the 81st site to benefit from Sers since its introduction in 1995. The last Sers project was announced in 2016 for West Coast Road, which involved eight blocks of flats. The fate of old flats have been a concern among Singaporeans following National Development Minister Lawrence Wong's warning last year that not all old HDB flats will be automatically eligible for Sers. Concerned over media reports that some buyers are forking out high prices in anticipation of Sers, he pointed out that only 4 per cent of all flats have been identified for Sers since the scheme's launch in 1995. I refer to the letter, "Spare a thought for older homeowners when reviewing issue of expiring lease of public flats" (May 20). While the writer's request appears reasonable, it should be carefully evaluated against the objective of our public housing policy, which is to enable Singaporeans to have a roof over their heads. Measured against the average lifespan of the population, a 99-year lease for a government-built flat is more than adequate to meet this objective. In a typical scenario, couples who marry after the age of 25 and buy a new four-room flat with a 99-year lease, for instance, will still have 55 years of lease left when they are 69. If their household income meets criteria and they apply for the Lease Buyback Scheme from the housing authority, they will still be able to receive a stream of income in their retirement years. Furthermore, if the flat's value appreciates at 2 per cent real term per annum (a conservative estimate adjusted for inflation), its value will have slightly more than doubled in more than 40 years. So if they choose instead to sell the flat and downsize, they can still get some money. The group that will not be able to get the maximum benefit will be those who buy resale flats with a shorter lease balance. However, those buying resale flats get a greater choice of locations. A person who pays more for a resale flat is paying for the benefits of this choice, meaning the convenience of living near to their workplace, a mature town with more amenities, having greater connectivity, etc. If they choose to spend more on housing for these benefits and have fewer financial resources in retirement, then that is a choice they make. It will not be equitable for the Government to extend the lease and indirectly subsidise their retirement. This is not incorrect, but it is only one aspect of the issue. The issue is complicated and complex and there are many issues and stakeholders, and moral hazards to navigate. The point raised in this letter takes one perspective. And yes, there are a lot of missteps and miscalculations and poor decisions and poor planning on the part of politicians, and on the part of citizens. Though to be fair, the citizens having less power and being more subject to economic forces have less of a choice. When your decision to purchase a home is between paying $300k for a flat in a "New Town" that is inconvenient and adds an hour to your daily commute to work, and an hour to your parents' travel to provide care for your children; or paying $600k for a place that is more convenient and gives you more time to spend with your family, that is not much of a "choice". It should not be that you should literally mortgage your retirement for a viable family life. If you sacrifice time with your family when they are young, what is the point of your "sacrifice"? The point raised is a valid one, but it is a narrow and single perspective. [Does that mean that] the solution is, there is no need to do anything? The cascading problem is what do you do about all the ageing flat owners in old flats with expiring leases, and who are unable to sell their flats to finance their retirement? Tell them, "you enjoyed the convenience of living where you want when you were young, now you can die in the home you bought with your retirement funds"? Even the govt is not THIS tone deaf. A letter writer hopes that in reviewing the issue of the expiring leases of HDB flats, the National Development Ministry will pay more attention to why homeowners want to sell their flats at a decent price. I refer to the report, "Government looking into lease issue of old HDB flats which involves 'serious trade-offs': Lawrence Wong" (May 17). The issue is on the anticipated fall in sales value of government-built flats which are nearing the end of their leases in the next few decades. This is apart from supply, location and other economic factors which play a part in the movement of the value of these properties. In reviewing this housing issue, I hope the National Development Ministry will pay more attention to why homeowners want to sell their flats at a decent price. For most of us who can only afford public housing, it is the major asset in our lifetime. We have an ageing population and for seniors, the extra income comes in handy when they downsize to a small flat. For aged couples, it is their wish not to burden their children with financial matters and they also wish to use the extra money from sales proceeds to enjoy their retirement years. The Housing and Development Board has learnt to do better in providing homes to young couples at a faster rate, in relaxing rules on income ceiling for applications, in providing grants to families, etc. Let it not forget the older citizens and not dismiss the impact that the cost of housing has on the older generation. The Government is studying the issue regarding the leases of older Housing and Development Board (HDB) flats, amid concerns about the impact of lease expiry on resale prices, said National Development Minister Lawrence Wong. SINGAPORE — The Government is studying the lease issue of older Housing and Development Board (HDB) flats, amid concerns about the impact of lease expiry on resale prices. Announcing this in Parliament on Thursday (May 17), National Development Minister Lawrence Wong also spelt out the "serious trade-offs" involved as he noted calls for automatic lease extensions or HDB lease top-ups by private developers. For instance, despite the authorities' best efforts at planning, Singapore is still severely constrained by space. If there is no more land to recycle for future public housing, it could affect future generations and their access to subsidised housing and their ability to have "an affordable and quality home in Singapore", said Mr Wong, who was speaking on the fourth day of the parliamentary debate on the President's Address. Noting that it is "not a straightforward matter", the minister said the authorities cannot assume that everyone wants a lease extension. More maintenance will be needed for older flats, and this will be costly for residents, he said. Acknowledging concerns about the impact of lease expiry on resale prices, Mr Wong reiterated that there is still value in older HDB flats, which can be unlocked for retirement. Based on transaction data over the past year, an older four-room flat with less than 60 years remaining would sell for around S$300,000 and a five-room flat would sell for around S$400,000 in non-mature estates. For flats in more popular locations, prices can be significantly higher – more than double the price, Mr Wong said. "So the transacted price depends not just on length of remaining lease clearly, but also depends on many other attributes. Factors like location, the storey height, the condition of the flat these are all very relevant," he added. Hence, the sales proceeds from older flats "would be more than sufficient to purchase a smaller flat for retirement", he said. For example, one can buy a two-room flexi flat from HDB with a 40-year lease for around S$100,000, or a three-room resale flat for about S$250,000, depending on location. Those who prefer to stay in the same place can also use the Lease Buyback Scheme, where they can sell part of the remaining lease to HDB or have the option of renting out a bedroom, he noted. "So the monetisation schemes we have are in place and they are working; we will continue to review and enhance the schemes, and help our elderly unlock the value of their flats for retirement," he said. On Monday, kicking off the parliamentary debate, Fengshan Member of Parliament (MP) Cheryl Chan proposed taking a "multi-prong" approach to help sellers and buyers by changing the valuation method for ageing units and extending the lease for flats in mature towns of selected precincts, among other things. Her suggestions came as the HDB resale market continues to be lacklustre, as flash estimates last month showed that prices of resale flats have fallen for six consecutive quarters. 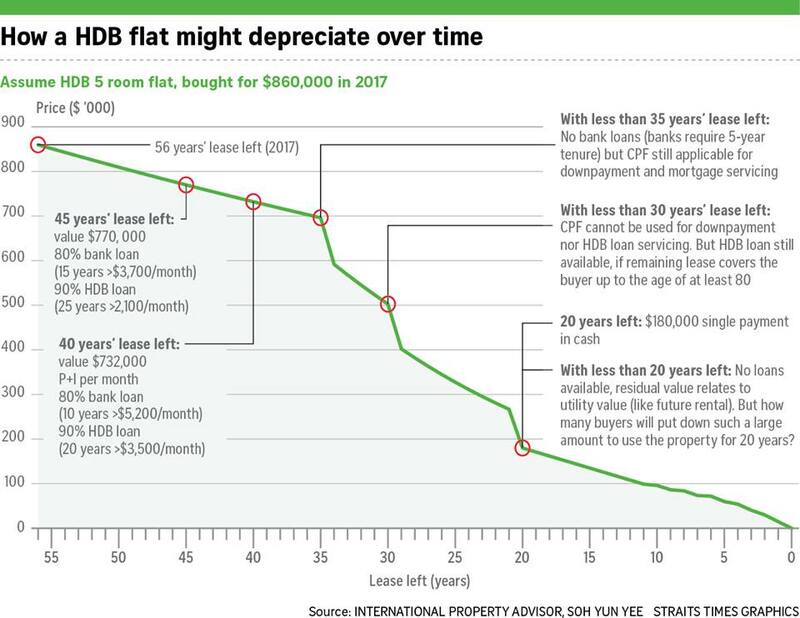 Some property analysts attributed this to the realisation among prospective buyers that not all old flats will be eligible for Sers, and the declining value of HDB flats with less than 65 years worth of lease left. In a Facebook post in March last year, Mr Wong noted that only 4 per cent of HDB flats have been earmarked for Sers since its launch in 1995. "For the vast majority of HDB flats, the leases will eventually run out, and the flats will be returned to HDB, which will in turn have to surrender the land to the State," he said then. All HDB flats have a 99-year lease. As of December 2016, there were a total of about a million HDB flats in Singapore. Among these, about 7 per cent were at least 40 years old. Another 29 per cent were between 30 and 40 years old, HDB had previously said. On Thursday, Marsiling-Yew Tee GRC MP Alex Yam pointed out that the ongoing en bloc fever has led to comparisons with the HDB “lease decay” situation. “That a 20-year old private apartment or a 40-year old HUDC (Housing and Urban Development Company) can undergo collective sale and thus monetise the asset for owners and turn back the clock for developers seems unfair,” he noted. Workers’ Party (WP) Non-Constituency MP Leon Perera said the possibility of HDB resale prices being dampened in the future as more Build-to-Order flats are built, among other factors, “places pressure on the goal of monetising one’s own HDB flat for future retirement income or even emergency or supplementary income”. “This is a large and complex issue which the Workers’ Party intends to study in the months ahead, with a view to make constructive suggestions,” he added. Mr Wong said he would welcome any ideas on the issue from the WP, or the public at large, for the matter. Nevertheless, he reiterated that the lease of HDB flats is "not an immediate issue" given that the vast majority of units have more than 60 years left on their lease. The oldest HDB flat today is about 50 years into its lease. Noting that buying and selling a property can be a complex undertaking, Mr Wong said it is "easy to get carried away by market sentiments". For instance, some were speculating in older HDB flats to get the Selective En bloc Redevelopment Scheme (Sers) benefits some time back. Now, people are overly anxious about how much their older flats can fetch in the resale market, he added. "My advice to Singaporeans is this: Don't buy or sell based on speculative information. Look at the facts and if you are in the market for a home, do your homework carefully, and choose something that fits your needs," he said. The government will make the resale market work better for potential buyers and sellers, such as by better matching the buyers and sellers in the market. More information on the available flats in the market – be it new flats or resale flats – can be provided to help buyers and sellers transact more smoothly and to make more informed housing decisions that best suit their needs. The authorities are also watching the private housing market, said Mr Wong. In contrast to HDB resale prices, the prices of private homes have been heading north, setting fresh records. "The Government cannot control or fix prices, But neither do we take a completely hands-off approach," Mr Wong said. "We recognise that there may be over-borrowing in a very low interest rate environment, and that sharp price changes that run ahead of fundamentals can be destabilising to the broader economy," he added. Apart from the various measures put in place over the years, the authorities will continue to monitor market trends closely and make use of various policy levers to ensure a stable and sustainable property market. "My assurance is that the Government will continue to provide affordable and quality homes for all Singaporeans – both now and in the future," he said. Mr Wong also dismissed speculation circulating online that the Government would stop the use of the Central Provident Fund (CPF) entirely for the purchase of HDB flats. "Let me be very clear about this. We are not stopping the use of CPF for HDB purchase. Even for older flats, CPF can still be used but under certain conditions to safeguard retirement adequacy of homebuyers," he added.